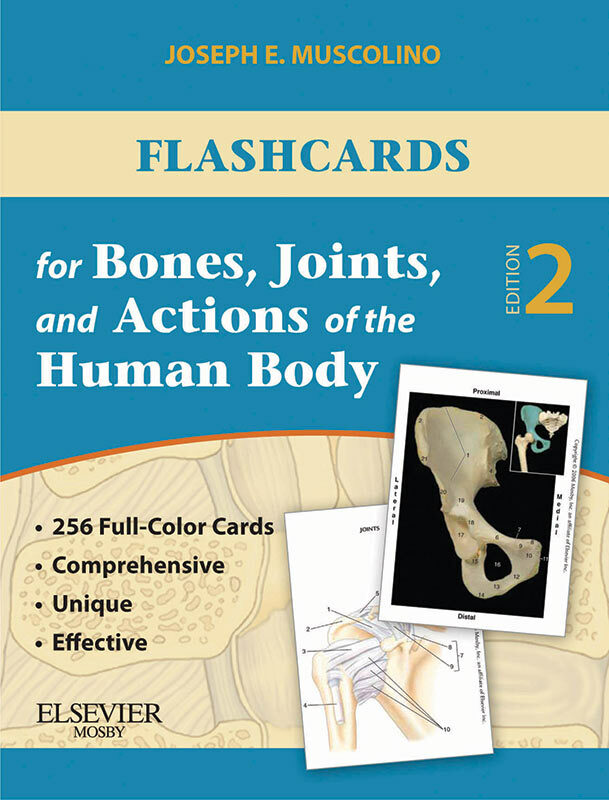 Flashcards For Bones, Joints, and Actions of the Human Body is an excellent study tool for students who want to learn the bones, joints, and joint actions of the body, and concepts of kinesiology. This set includes 256 full-color cards that provide a fun, quick, and portable way to study. Also included is a booklet containing helpful study hints for learning this material. The drawings, terminology, and page references match with those in Joe Muscolino’s popular text, Kinesiology, The Skeletal System and Muscle Function. 112 bone cards show all the bones, bony landmarks, and joints of the human body in real photographs instead of drawings! The front of each card contains the photograph of the bone; the back of each card has the names of all the bony landmarks to allow for self quizzing. The joints are then covered again, this time with 48 cards containing drawings that clearly depict the bones and joint capsules and ligaments of the joints. The front of each card contains the illustration with lead lines and blanks. The back of each card has the names of all the structures depicted on the front, allowing for self quizzing; along with the structural and functional classifications of the joint and an interesting fact about the featured joint. 58 joint action cards contain photographs with the bones drawn into the photograph that show the joint actions of the body. shown on the front of the card, the plane in which the joint actions occur and their ranges of motion, and the reverse actions of the depicted joint actions. As an added bonus, there are 38 kinesiology concept cards. Each one depicts an important concept of kinesiology with an illustration on the front of the card and the text that explains the concept on the back of the card. These cards are an ideal way to test oneself on the major concepts of kinesiology! Six rings are provided that allow you to place cards into groups to carry with you and study!